We spend a lot of time at the Cleveland Botanical Gardens. They have an year round three story glass house that contains two special exhibits, The Spiny Desert of Madagascar and a Costa Rican Rain Forest complete with thousands of tropical buterflies. 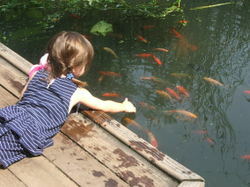 The children and I love to come there in the winter months when it is cold, grey and dreary in Ohio. This time of year, the temperature in the glass house matches that of outside, hot and humid. 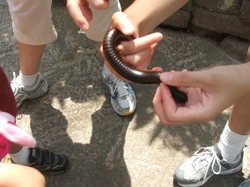 Traveling through the Spiny Desert, we were encouraged to touch the largest millipede that I have ever laid eyes on. We were all brave enough to touch its hard shelled back, everyone except Grandma who was a bit squeamish. We took my grandmother to see the butterflies and she had a lovely time. There is something magical about walking into the glass house and being completely surrrounded by butterflies. Their bright and glowing colors, coupled with the lush vegetation is enough to bring smiles to the gloomiest faces. This is the place that began to heal the wounds of Mary terrified of crawling and flying insects this past Spring. 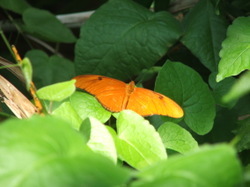 It is the place responsible for turning our family into Lepidopterophiles (butterfly lovers)! 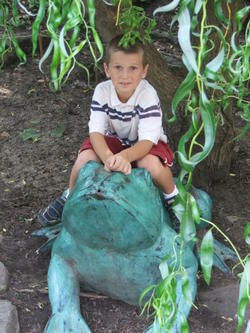 Another wonderful highlight of this family friendly place is the outdoor Children's Garden. Here is a wonderland of flowers and plants, heaven for a tactile learner! 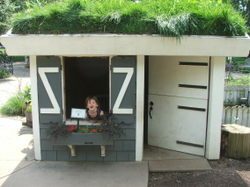 This garden contains a sundial fountain, vegetable garden, herb garden, tree house, arborvitae maze, fish pond, rock wall with cave, miniature playhouse with sod roof, water pumps for filling dozens of provided watering cans and compost bins for children to learn the composting process. Everything is entirely hands on and getting dirty is encouraged. The children who visit the garden tend its every need, planting the seeds in Spring, weeding and watering in Summer, harvesting the vegetables in Autumn. We visit this garden during the three seasons that it is open. The children have come to know and love this place. "Every child should have mudpies, grasshoppers, water bugs, tadpoles, frogs, mud turtles, elderberries, wild strawberries, acorns, chestnuts, trees to climb, animals to pet, hayfields, pinecones, rocks to roll, sand snakes, huckleberries and hornets. Any child who has been deprived of these has been deprived of the best part of his education."